It has been my privilege to attend four of your birthday parties. I also want to take this opportunity to congratulate the 48 Group Club. This year marks your 60th anniversary. 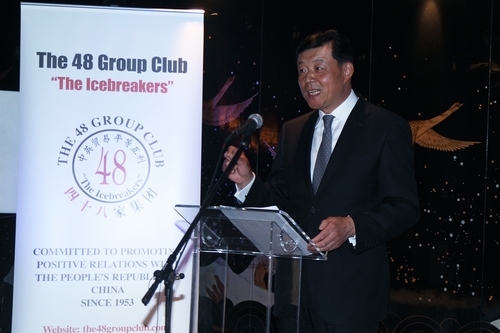 Over the six decades, the 48 Group and its successor the 48 Group Club have carried on the spirit of the ‘Icebreakers’. I applaud your belief in peaceful development and mutual benefit between China and UK. During the past 60 years you have made outstanding contributions to China-UK economic cooperation and overall bilateral relations. Chairman Perry has asked me to talk about the ‘Chinese Dream.’ I am very glad to respond to his request. This is a topic that is currently generating much interest both in China and around the world. Dreams about China are not new. Over the past century Chinese people have dreamed a lot of dreams about their country. “I dreamed of standing on the summit of the Kunlun Mountains and seeing a peaceful China”. So Mr. Liang’s dream was about peace and prosperity. Dr. Sun Yat-sen’s Chinese dream was reflected in his work called the Fundamentals of National Reconstruction. That book was mostly about modernisation. · The ‘Three Gorges dream’. · And then the ‘World Expo dream’. Today all these dreams have come true. Then what is the meaning of the ‘Chinese Dream’ recently initiated by President Xi Jinping? · A prosperous and strong China. · The revival of the Chinese nation. · And a contented life for the Chinese people. These aspects are three-in-one. None of them are dispensable. The Chinese dream sets the goal and direction. So, is there a roadmap? · The first goal is to double both GDP and per capita income by 2020 on the basis of the 2010 level. This means that the building of a ‘well-off society’ will be completed. This goal is simplified as the ‘two doubles’. · The second goal is to turn China into a socialist modernised country. It means that, by the middle of this century, China will be rich, strong, democratic, culturally advanced and harmonious. · And second the centenary of the People’s Republic of China. So these aims are also known as the ‘two centenary goals’. Through building on the two goals, China will advance to achieve the great revitalisation of the Chinese nation. This is the ‘three-step’ strategy for fulfilling the Chinese dream. The ‘American Dream’ was first advanced in 1931 by American historian James Adams. His description suggests an individual will realise his ‘dream’ through honest work irrespective of colour or faith. This definition of the ‘American Dream’ provides a sharp focus on the cultural difference between China and the USA. In China the ‘Dream’ is driven by the communal interest of all the people. The ‘Chinese Dream’ is the dream of a country, a nation and a people. The ‘Chinese Dream’ is not just the dream of the Government and leaders of China. The ‘Chinese Dream’ is also very much the heartfelt dream of every Chinese. It is a common dream. The ‘American Dream’ embodies American culture and national character. How will the Chinese people come together to achieve the “Chinese Dream”? Building on the words of President Xi, the Chinese government has decided to work hard in three areas. · Transform its economic growth model and readjust the economic structure. · Press ahead with people’s democracy and stick to the political system with Chinese characteristics. · Advance cultural development and take a deeper understanding of China to the world through its long and rich culture. · Step up efforts to improve people’s welfare and raise living standards. · Strive to build a beautiful China through sustainable development. · And a beautiful environment. China’s rapid growth in the past three decades is attributable to ‘reform and opening up’. China’s future development still hinges on ‘reform and opening up’. Here I draw on an analogy. Once the arrow is released from the bow it can never return. In the grammar for reform, there is only ‘continuous tense’, no ‘perfect tense’. In turn, once the door is ‘open’, it will always be ‘open’. ‘Reform and opening up’ offer an inexhaustible driving force for China’s future development. In this sense the ‘Chinese Dream’ is also the dream of ‘reform and opening up’. The third area of hard work is to stay on the path of peaceful development. The ‘Chinese Dream’ is not to seek supremacy. It is to regain the worthy status of China and take on the responsibility of a big country. China’s development means opportunity, not threat to the world. · China will continue to play an active part in international political, security and development affairs. · China will contribute a constructive role in maintaining world peace and regional stability. · China will promote an equitable and reasonable international order and global governance. · And China will boost international cooperation and world economic growth. · In the coming five years China’s imports will amount to 10 trillion US dollars. · China’s overseas investment will reach 500 billion US dollars. · The number of China’s outbound tourists will pass 400 million. All these factors will undoubtedly stimulate global growth. So the ‘Chinese Dream’ is also a dream of peace, cooperation and mutual benefit. 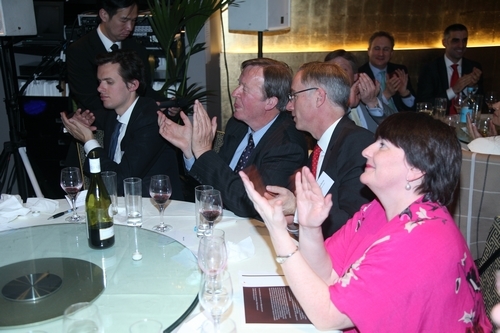 I know Mr. Jim O’Neill is with us tonight who is famous around the world for his concept of the BRIC countries. When Mr. O’Neill advanced the idea of BRIC’s I feel sure he could not have imagined that so soon BRIC’s would become a household name. I sense he would have been surprised to see the expanded BRICS operating as a group. We saw this very recently in South Africa. The BRICS have become a force for change big enough to reshape the world landscape. So is true with the ‘Chinese Dream’. Today it is a dream. Tomorrow, it will be reality. Through understanding the ‘Chinese Dream’ you will identify China’s goal and direction. You will understand China’s present and future. Perhaps I can be bold enough to update the spirit of these words and say ‘Young men and women’! · I look forward to your creation, action and innovation. 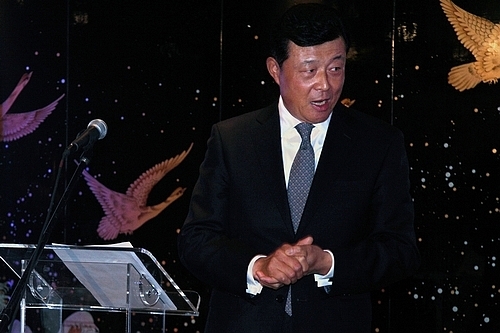 · I expect you to seize the opportunities brought by the ‘Chinese Dream’. 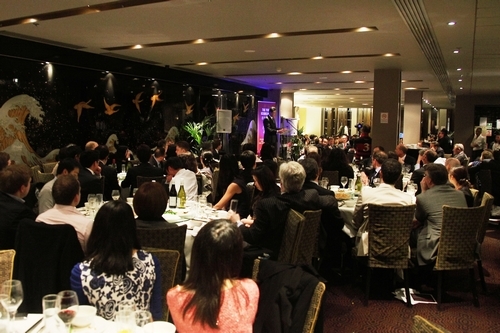 · I encourage you to contribute your part to a brighter future of China-UK relations. · I urge you to make true our common dream for China-UK relations. In conclusion I wish you many more successful anniversaries!